Trey Anastasio is clearly enjoying himself. If the toothy grin he flashes onstage these days doesn't say it all, the endearing, to-and-fro pogo dancing he busted out on this night is further evidence that this guy's loving the single life. Free of the constraints, expectations and the arena-sized audiences of his old band Phish, the singer-guitarist made a compelling case at the Wiltern LG that he will survive. Anastasio's assured, three-hour concert didn't lack much, but what it did lack was the momentum-killing, 30-minute set break. In a move that seemed radical in today's clichéd jam band scene, this tour-closing performance was a brisk, one-set affair, a runaway train that raced, braked, and eventually hurtled into the Police. But more on that later. Backed by his ace seven-member group 70 Volt Parade, bandleader Anastasio was clearly charged up and delighted to be breaking in two new recruits, New Orleans drummer Raymond Weber and saxophonist Russell Remington. With his vocals nicely padded by backup singers Jennifer Hartswick and Christina Durfee, the riff-and-squeal guitar maestro provided fresh thrills, nostalgic chills, and eye-popping spectacle. Credit the spectacle part to former Phish lighting wizard Chris Kuroda, whose kinetic, big venue-caliber lighting was lush and colorful, yet practically seizure-inducing in the tight quarters of the Wiltern. 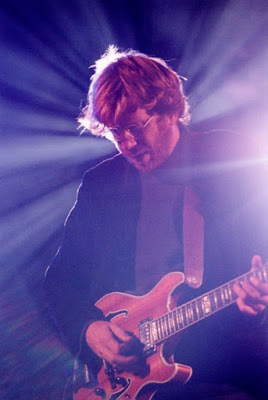 Focused and steering clear of dead-end noodling that sometimes made Phish stink, Anastasio delivered solo material ("Air Said to Me" and "Come as Melody," high-impact rockers from his new CD Shine, book-ended the show) and some welcome Phish tunes, the latter done mostly solo acoustic. It was refreshing to see Trey playing an acoustic guitar; it's something even longtime Phish fans have rarely, if ever, seen him do. So when the crowd echoed the chorus of "Wolfmans Brother" or went all campfire sing-along on "Chalkdust Torture," it was both a knowing nod to the rich history of artist and audience as well as a loving, we'll-follow-you-anywhere, Trey sort of benediction. And since Trey's earned all this musical capital, by God, he's going to use it. His stature was cemented at the end of the show by his ability to lure no less than Police drummer Stewart Copeland for a run through the pile-driving "Rubberneck Lions" (from Anastasio, Copeland and Les Claypool's now-defunct side project Oysterhead) and the Police's tension-and-release exercise "Cant Stand Losing You." Don't worry, Trey, you haven't lost us yet.